You are currently browsing the daily archive for June 14, 2011. 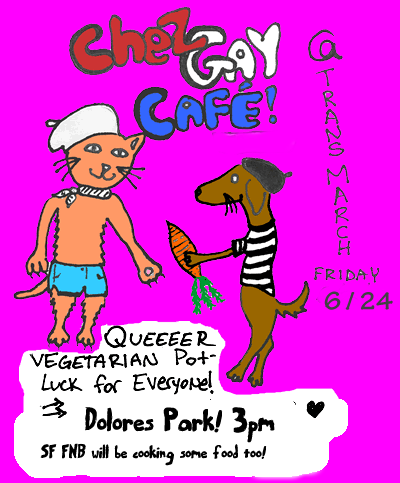 Join SF FNB for our annual tradition — the Chez Gay Cafe and Potluck at the Transmarch! We’ve been doing this for 4 years now and are super excited for it to be this time of year again! San Francisco Food Not Bomb will provide some food, be cooking veggies at the park, but PLEASE bring veg food to share. All are welcome to share food and eat. – for bringing food to share or chopped food to grill. We’re generally a chill bunch, but disrespect for queer, trans, genderqueer or gender variant folks will not be tolerated.